What I have heard of Aho’s music – and he is immensely prolific – makes me think of Martinů. Like Martinů he can write fast, rhythmically exciting music. He can write long lyrical lines. He feels the colour of individual instruments and writes idiomatically for them. And there is something fundamentally cheerful and life-enhancing about his music, as there is with Martinů, as there was before him with Joseph Haydn. However, Aho's harmonic sense is different, and I don’t know that he has characteristic chords and chord progressions as does Martinů. I would call him a neo-Romantic rather than a neoclassicist, and there is nothing forbidding about his music. There is a useful survey on MWI here. At the last count Aho has written seventeen symphonies and twenty-nine concertos. He would seem to have a particular interest in the saxophone as, in addition to the concerto for soprano saxophone which we have here, he has also written one for tenor saxophone and another for a whole saxophone quartet, while also frequently including one or more saxophones in his other orchestral scores. 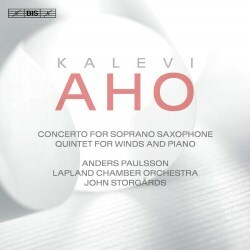 This particular concerto was commissioned by the soloist and orchestra we have here, and arose from an occasion when Aho heard the soloist, Anders Paulsson, give a performance of the Swedish composer Anders Eliasson’s soprano saxophone concerto. Paulsson told Aho that he liked Aho’s clarinet concerto and asked for a concerto for himself. Three years later this came about, after Aho had visited Paulsson to learn more about the instrument. He also seems to have taken some ideas from Eliasson’s work. The premiere was in February 2015. There are three movements. The first begins with a long exploratory solo over long-held chords on the strings. I was reminded of the opening of Vaughan Williams’ The Lark Ascending. I should say that you should forget about jazz when listening to Paulsson: he has a sweet tone, with almost no vibrato, and he can sound like a flute or even an oboe, but emphatically not like a clarinet. The woodwind instruments join in and then we move to the main section, which is fast and virtuosic and takes the soloist to the limits of his range, both high and low. This is eventually interrupted by a solo cadenza, which features multiphonics, which are chords of a kind not normally playable on a wind instrument. The slow movement returns to the mood of the opening of its predecessor. However, here the soloist exploits other new techniques, such as microtones and slides between notes while again the strings play long-held chords. There is a strong sense of mystery in this movement. The finale begins as if it is going to be a march, over which the soloist makes fanfare-like calls. The tensions rises and leads to a very fast but quiet passage with ghostly whisperings by the soloist. There are more multiphonics. The work then ends by fading away. The obvious coupling would be the tenor saxophone concerto, but instead we have the piano and wind quintet. This is scored for the same combination as Mozart’s celebrated quintet K. 542, of which he was rightly proud, but which is difficult to programme, since there is only one other well-known work for the same combination, Beethoven’s early Op. 16 quintet. Aho has written a completely different kind of work from Mozart, and in four rather than three movements. If he has any predecessor in his mind, I would say it was Ravel’s piano trio. The first movement is the longest, and we notice that the four wind instruments tend to form up in pairs, with the flute and clarinet together, and the horn and bassoon. The main part of the movement is a dance led by the piano. The second movement is a toccata, again led by the piano, often at the top of its range and with lots of rapid repeated notes. The rhythmic drive is kept up throughout, a rare thing in contemporary works. This is followed by a dreamy Nocturne. The finale is another fast dance, with rapid and virtuosic passages for the wind instruments. Finally we have Solo I, an early work. This is one of a series for different instruments which runs to twelve pieces so far. This is constructed like one of Liszt’s Hungarian rhapsodies, with a slow introduction leading to a very fast main section. This is rhythmic and the composer suggests it is slightly reminiscent of Stravinsky, but it contains much more obvious virtuoso fiddling than do Stravinsky’s violin works, no doubt because the violin is Aho’s own instrument. This is an exciting work. The performance of the concerto is obviously authoritative, since it is played by its dedicatees. I had not previously come across the Lapland Chamber Orchestra, but I gather they are the most northerly professional orchestra in Finland. There is a picture of them, and they seem a friendly bunch. Wind soloists from the orchestra play in the quintet and the pianist Väinö Jalkanen tackles the tricky piano part with aplomb. The violinist Jaakko Kuusisto is also a composer and a conductor but he has clearly not neglected his own instrument as he provides a fearless performance of the demanding Solo I. The recording, which I listened to on ordinary CD, not SACD, is exemplary and Aho provides his own articulate and helpful notes, which also appear in Finnish, German and French. The booklet also lists eleven other recordings of Aho concertos on the BIS label. I would like to explore all of them, and, if BIS would fill their gap in the symphonies (Nos. 5 and 6) and issue the first dozen or so in a box, those as well.